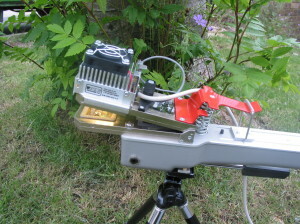 The PLU5 is a lightweight and compact white LED light source for use with the LCi ultra compact photosynthesis system. The light unit can provide up to 2,000umol of cool, white light at the leaf plane. A separate control unit allows researchers to maintain or adjust the light level to the required intensity. The light system is powered from the LCi console and so no extra power source or battery is required. The use of low power LEDs means that the spectral quality of the light is maintained over the whole intensity range.